I’ve started the new treatment, it’s a hormone drug which is making me feel rough. Hot flushes, feeling sick, dizziness to the point of almost fainting, a lingering headache which isn’t quite there. And to top it off I’ve still got the original pain. I’m giving it a few more days to ‘get used to it’, then going back to the Dr man. In the meantime, I’m off work. At least I’m getting a lot more knitting done! Plus I’m about 1/3 of the way through The Count of Monte Cristo on audiobook. I read the Count once, but the cheap copy of the book I bought had 2 chapters missing somewhere in the middle, and it turned out those were crucial to the plot so the story never quite made sense. I still read it to the end, thoroughly enjoyed it, but goodness only knows what happened in the missing chapters! I’ll hopefully find out in the next few days. My knitted top is coming along now, I’ve finally finished the lace pattern and am on the straightforward bit. Straightforward until it comes to things like shaping and finishing that is. I’m just hoping the instructions make sense when I get to them. 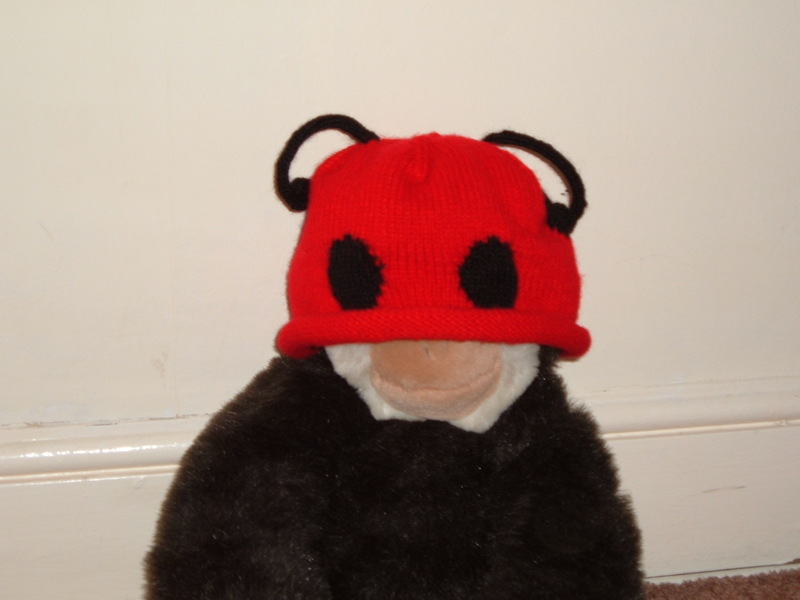 If it works, above is the picture of the hat I knitted for my friend’s little girl…if this doesn’t work, I dunno how to get it there! The hat is modelled by Monkey, not by Maya. This entry was posted on June 3, 2008 at 10:35 am and is filed under Health, knitting. You can follow any responses to this entry through the RSS 2.0 feed. You can leave a response, or trackback from your own site.